•Durable adhesive achieves high pull-off force and is unaffected by vibration. •4-way opening allows cable ties to be installed parallel or perpendicular to bundles. •Predrilled holes extend mounting options and security. •Extended adhesive liner is easy to remove quickly. •Durable adhesive achieves high pull-off force and is unaffected by vibration. •4-way opening allows cable ties to be installed parallel or perpendicular to bundles. •Predrilled holes extend mounting options and security. •Extended adhesive liner is easy to remove quickly. 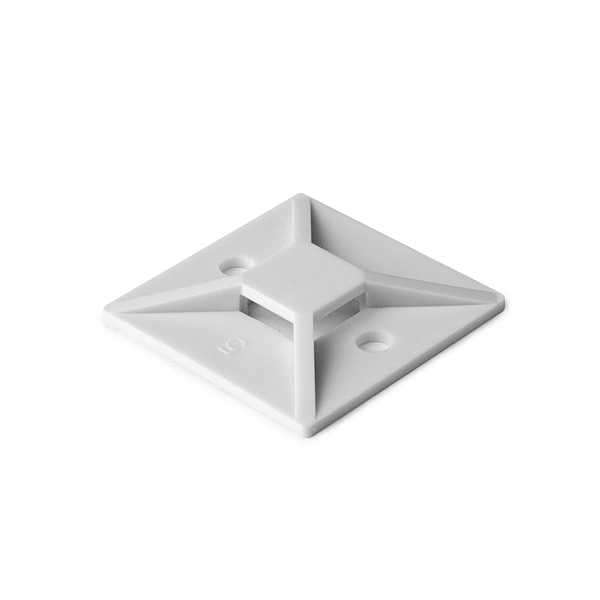 HellermannTyton Adhesive Cable Tie Mounting Bases are used with T18 through T150 Series cable ties to provide stability when securing bundles. The mounts are installed using the adhesive backing and/or by securing two or four screws. The 4-way opening allows the cable ties to be inserted parallel or perpendicular to the wire bundles. Rubber-based adhesive allows for a permanent bond to most surfaces.